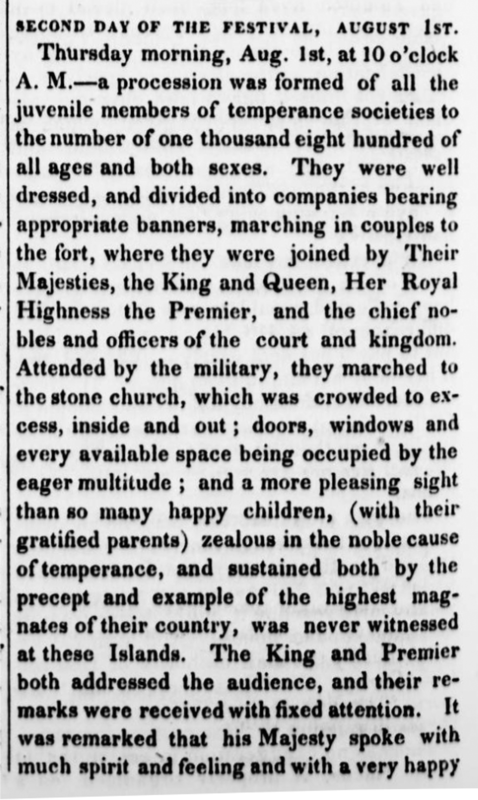 More on Hawaiian Independence Day and Aloha Aina, 1843. Book 2. HONOLULU, OAHU, JANUARY 17, 1843. Paper 17. Here are some letters from Haalilio; people will surely be happy to hear from him and Mr. Richards that their travels are going well. Weletabu [Vera Cruz ? ], Mexico, Nov. 2, 1842. My dear friend, much aloha to you and your entire household. Here am I, your friend, with feeling aloha for you. The two of us [Haalilio and Richards] arrived here on the 29th of October, and we are awaiting a ship to ride. Hear me, I am doing fine, I have no illness; my health is fine now. However, I do not know how it will be when we get to the cold lands; perhaps it will be alright, and perhaps not. Hear me, we have travelled about this expansive land with peacefully, we were not troubled, we were cared for well by the Lord, until arriving here. But our bodies are spent after the long road. The days were extremely hot and extremely cold; we got drenched by the rain and snow, we passed through mountains, and rivers, and the wilds here in Mexico; we swam the water of rivers running by the face of the mountains, during the day and the night. In the cold and the heat, we endured hunger, riding on the backs of mules all day long. But I was certain that Jesus was with us in this friendless land. And that he blesses us. He takes care of the two of us, and our bodies are not troubled or hurt. He supplies us with all of our needs. He has welcomed us always amongst good friends; and there, we were given comfort and help on our path. Listen to this, I’ve seen the towns of these lands; they are countless, and I have seen Mexico the great Town of the president [alii]. I’ve also seen the silver mines, and how they work silver; we’ve been to the legislature of the alii and his residence. Those places are grand to see. And today I am with health, giving my aloha to you and your wife and the children; give your [my?] aloha to all the friends there, and to Hana folks and to your people and to my household, and to the land and to the chiefs. Aloha between us, Let us live through the Lord; until we meet in joy once more. Mexico, Weletabu [Vera Cruz ? 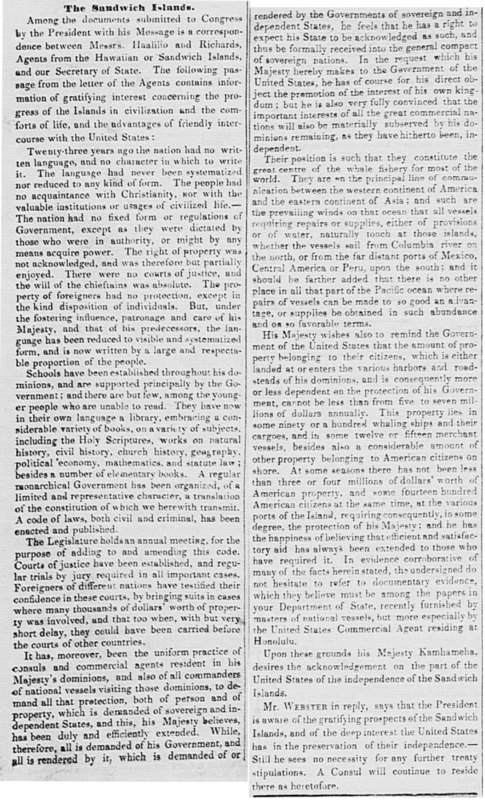 ], Nov. 8, 1842. Much Aloha to you; we received your letter on this day, the 8th of Nov., 1842. And we’ve understand all that was within. I have much aloha for you, and for all of you. How sad for all the alii, and how sad for Kapihi! We have been blessed this day in seeing your letter. There is much aloha for us all and our homeland. We are travelling aboard the American warships, Falmouth [Falamaka], to New Orleans [Nuolina]. A steam-powered American warship arrived, a huge vessel, 247 feet long and 2,400 tons. As I watch her sail by steam, it is a fantastic sight; she is so swift, with no comparison; this is the first time I’ve seen a steamer, and I am totally captivated by it. Much aloha for you; here we are safe, steadfast in our duties we swore to. Aloha to you. T. Haalilio. The two of them are headed to Washington aboard the steamer, a warship named Missouri, and perhaps they will land in Washington in 9 days. [Does anyone know if Weletabu in Mexico is Vera Cruz, or if it is somewhere else? Ka Nonanona, Buke 2, Pepa 17, Aoao 81. Ianuari 17, 1843.